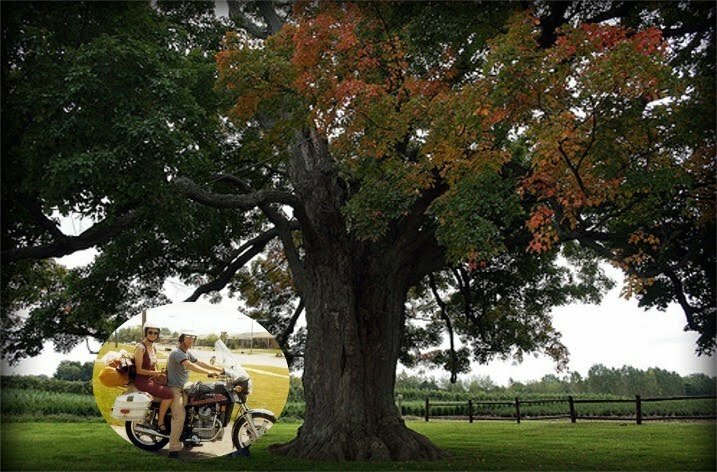 bernie and i were either at home or at work most of the week so i thought i would just write here about the "comfort maple tree" which is situated a few miles from welland..
now the little red car has never seen the huge comfort maple..bernie and i have quite often driven by motorcycle to visit this pelham piece of history. these two little lassies are dressed appropriately for a ruby tuesday! 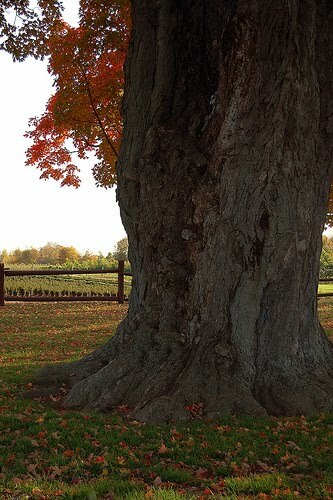 here is just a touch of autumn, peeking around the trunk of this beautiful tree! here is what the tree looks like in spring! 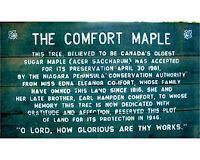 "i have taken this small history of the comfort maple from google and am copying and pasting it here because it is so interesting and so well written..
﻿"The historic Comfort Maple is a beautiful Sugar Maple tree. 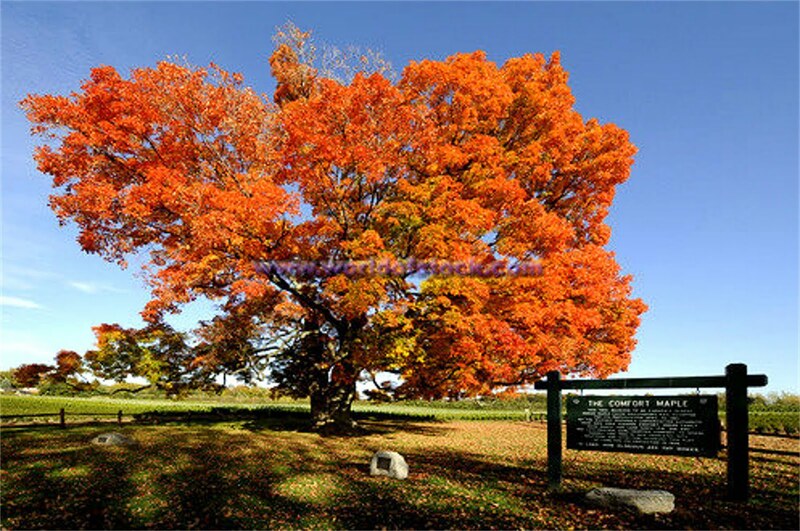 Estimated to be 500 years old, the Comfort Maple is the pride of the Town of Pelham and is thought to be the oldest Maple tree in Canada. The Comfort Maple is 80 feet tall with a trunk that is 20 feet in circumference. The crown spread is 30 meters ( 100 feet). The trunk and branches are supported by guy wires reaching skyward 34 meters or 112 feet, as high as a ten-storey building. 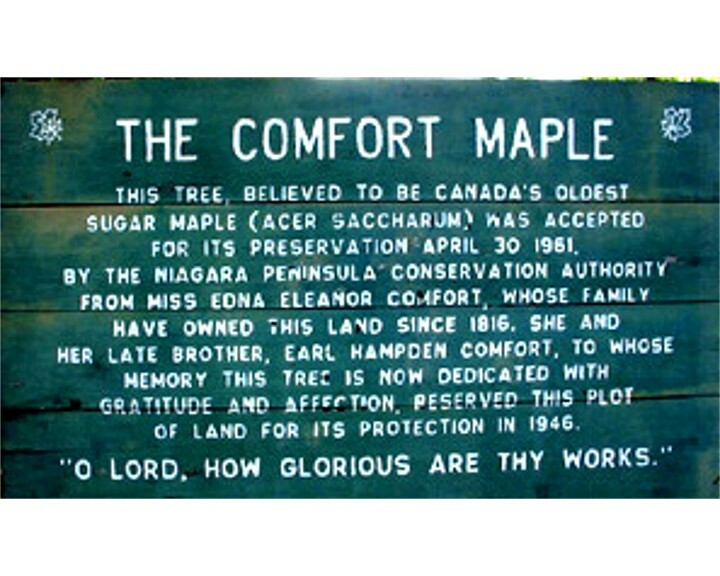 The Comfort Maple owes its name to one of the land's previous owners, the Comforts, who as United Empire Loyalists were known to have nicknamed the tree "Old Glory". The Comforts bought the lot from Major David Secord, brother-in-law of Canadian Heroine Laura Secord in 1816. 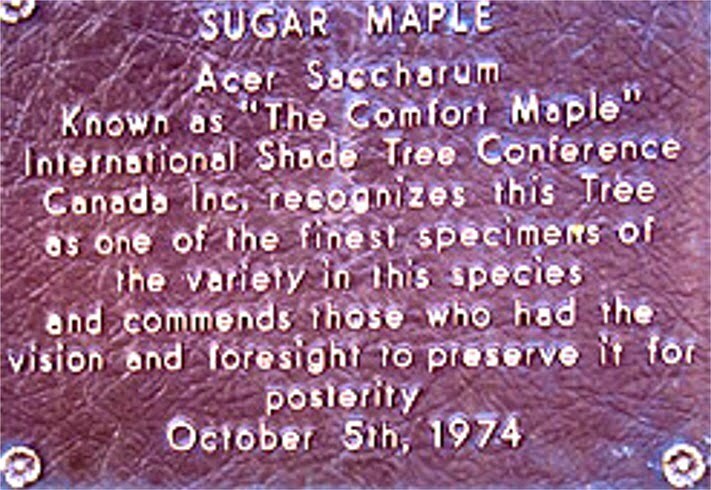 The Comfort Maple is located in the Comfort Maple Conservation Area, at Metler Road in the Town of Pelham. The Conversation area is protected by the Niagara Peninsula Conservation Authority." ps.. i remember a a few years ago, the politicians wanted to cut the comfort tree down to put up buildings. the people fought against this and this is ONE fight that the people won! Hi Terry, That is very interesting. 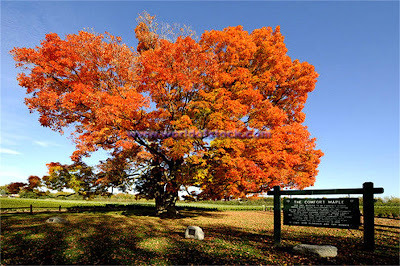 It is a beautiful tree. Too bad the little red car has never seen it! You found my Ruby Tuesday post, it is the same as my Mellow Yellow Monday post and my Shadow Shot Sunday post! I think I'm pretty smart sometimes, making one post do for two or three memes! Thanks for the comment, even though you didn't find what you were expecting! i had gone back to your post and read the label and by jimminy, it DID say ruby tuesday and you know what?..that is a real good idea blending them all in together because i really do wonder how on earth you and mary the teach and so many others can manage all of those memes! 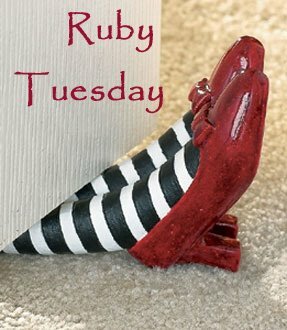 have a great ruby tuesday and i am really looking forward to yours and all my american blogger friends thanksgiving post..of course i know it will be a couple of days later because who in the world would be blogging when they can be enjoying good family time together and good food!!! Hi Terry, I like the Comfort Tree that you have. It would make a nice place to put up an antenna, way up high there. Happy RT! I am not playing this week, I am 'working' on stuff around the house. Of course I have a post but there won't be many comments to answer. Wow that is a beautiful tree Terry.My sister sent me a bottle of mayple syrup, its delicious. 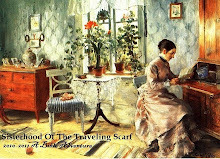 I have some roses on my blog, did you see them? that's a very beautiful old tree! and the girls are cute! "come and visit my place if you have the time! 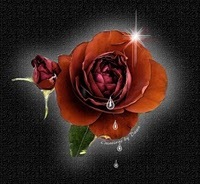 yes amrita..i saw your lovely roses and the nice video you put in. i made a comment the other day over at your place about them. i wonder why you didn't see it amrita..the roses were so nice.! The comfort tree is a wonder. No more, no less. It must be a sight for soar eyes all four seasons. 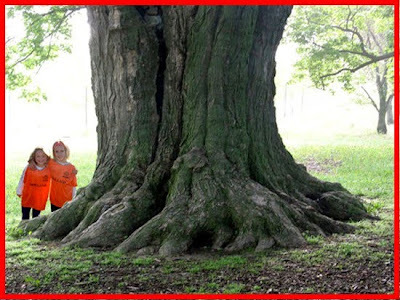 Wouldn't it be nice if you could make a new report about the comfort tree revisited? I'd sure love it.500 years of "Comfort" that's amazing. I think I have posted this poem before. It just seems to be an appropriate greeeting to the Comfort tree and to you. Thanks for sharing this morning, Terry. I will get back here to check out your U.S. Thanksgiving greeting. 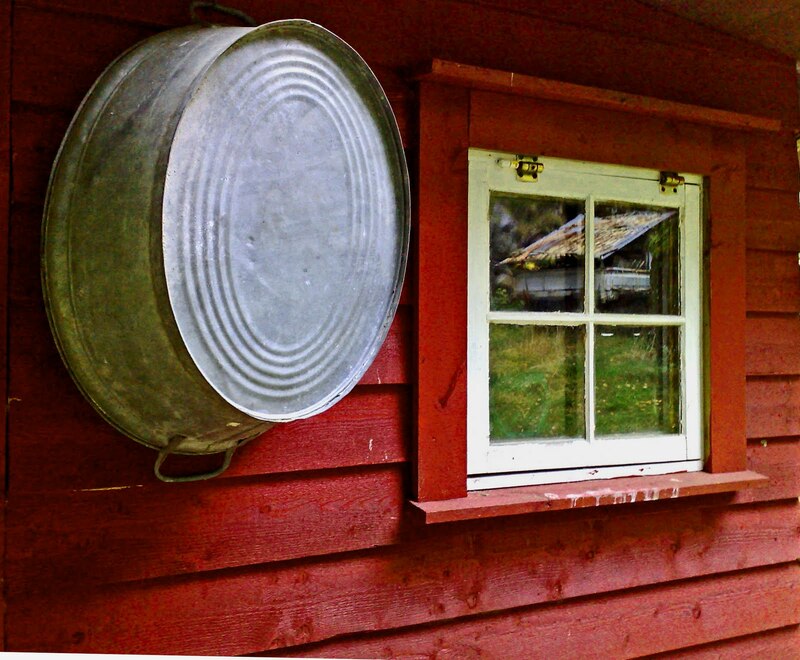 "Somehow we got those tubs to school too. All, teacher included, would bob for apples at our Halloween time party. We had around eight inn our grade 1 -8 one room school house. After the second grade I never had another kid (after the one in the poem) in my class until high school when there were three for the first two years (I rode my horse to that school)." What an amazing tree! Even though the name came from the owners, I think there is something comforting about a beautiful living thing that has lived that long and given joy to so many. Hi Terry :) those are really nice ruby photos! may fave is the two lassies! :) cute! good thing they've won over those silly politicians who dont have anything to do other than to annoy people :) Happy RT! Rather cool site you've got here. Thank you for it. I like such topics and anything connected to this matter. I would like to read a bit more on that blog soon.